The final days of the 2012 Edinburgh International Festival were marked by exuberant Boycott Israel demonstrations outside the Playhouse theatre and drama within, as world-renowned dance company Batsheva wrestled with the consequences of being promoted by the Israeli state as its cultural ambassador. A mobilisation by a coalition of groups under the umbrella “Don’t Dance with Israeli Apartheid” generated vociferous debate in the Scottish media in the preceding weeks and won support from leading cultural figures. See a full report on the Boycott Israel Network website. 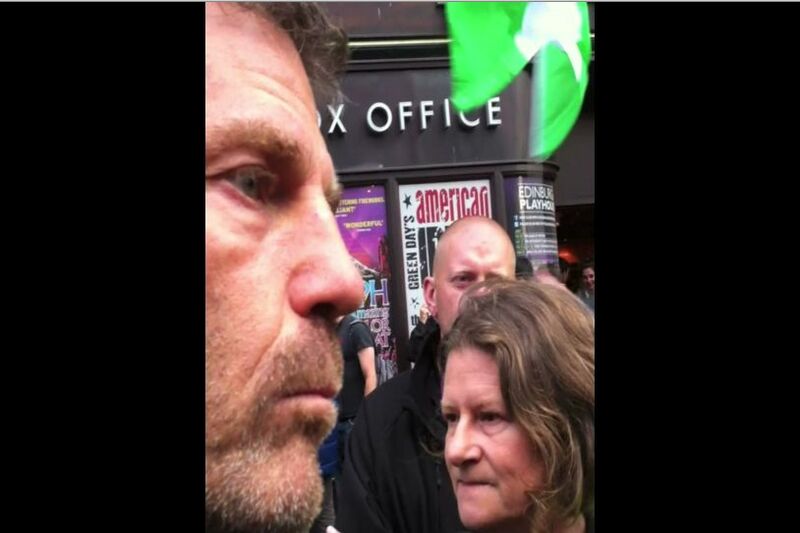 In one of the video clips recorded during the protests, Naharin – who has been attacked by the Israeli Right for his radical views – can be seen listening gravely and nodding as leading activists explain how significant it would be if Batsheva were to publicly dissociate itself from Brand Israel – a PR project which misuses culture to deflect attention away from the Occupation and other injustices against the Palestinian people. Beside him, the company’s general manager Dina Aldor is emphatically shaking her head. The moment highlights the dilemma of artists attempting to engage as people of conscience with injustice in their own societies while being required to act as flag bearers for the entity perpetrating the injustices. This must have been a familiar dilemma for culture professionals during the apartheid era in South Africa. In Edinburgh Naharin sought out boycott activists and told them that his company was not part of Brand Israel; that Batsheva’s funding had no political strings attached. Within the Boycott, Divestment and Sanctions (BDS) campaign initiated by Palestinian civil society, the rationale for targeting elite Israeli cultural institutions is that they are – whether they like it or not – inextricably bound up with Brand Israel, begun by the Israeli Ministry of Foreign Affairs in 2005. Hence the appearance at the Edinburgh Playhouse of both the Israeli ambassador to the UK, Daniel Taub, and culture minister Limor Livnat who declared: “Batsheva Dance Company is one of our flagship cultural institutions”. Batsheva is just one of the institutions enmeshed in the Brand Israel system. Treating any of them as normal merely reassures Israelis and their government that no change is needed. Israel’s apologists, while attacking boycott campaigners for sullying the purity of art with the grime of political action, attempt to explain away Brand Israel by portraying it as no more sinister than British Council garden parties in foreign lands – just a bit of innocent bridge-building. Zionist frontmen/women, such as actress Maureen Lipman, are wheeled out to express astonishment that anyone could wish to limit the freedom of expression of artists out of sheer bigotry, just because they are from Israel. The unsubtle subtext here is that all boycott campaigners are antisemites – even the Jewish ones. Let’s set aside the fact that Zionists vigorously pursued their own cultural boycott campaign against Soviet targets in the 1980s, disrupting ballet and orchestral performances in pursuit of their political goal of bringing dissident Soviet Jews to Israel. The freedom of expression people like Lipman claim to uphold is a distant dream for Palestinians. Palestinian artists face daily humiliation, racist discrimination, checkpoints, strip-searches, legal impediments to what they may or may not address in their work, and direct attacks on cultural facilities and events. The notion of Israeli art building bridges is to most of them laughable, an insult. This emerged clearly during the visit to London in May 2012 of the Palestinian theatre group ASHTAR and again in recent discussion about Red Hot Chilli Peppers’ decision to breach the boycott. Most leading Israeli artists confronted with a clash between culture and conscience (to quote the strapline for the Scottish Sunday Herald’s four-page review of the Batsheva drama) have responded by willingly embracing their cultural ambassador role, like the Israel Philharmonic Orchestra, or by pathetically claiming, like theatre director Ilan Ronen, that they have no choice but to perform in the illegal settlements if they want to collect their government subsidy. Reports at the time cited sources in the Foreign Ministry attacking Naharin, saying his statements “seriously harm the image of Israel, especially in view of his being an Israel Prize laureate”. Naharin was quoted as saying his prize was an award from the citizens of Israel, not from the stewards of the state. But this did not prevent Livnat in Edinburgh, representing the most right-wing government Israel has ever had, proudly embracing Naharin’s company Batsheva as a standard bearer for the Israeli state. These arguments are similar to those deployed by Dominic Dromgoole, artistic director of Shakespeare’s Globe, when defending its invitation to the Israeli national theatre Habima back in May. Some members of Habima were reported to have signed a pledge not to perform in the illegal settlement town of Ariel. So Dromgoole argued that the company should not be targeted, even though it had staged performances in Ariel’s Hall of Culture. Many leading British theatre professionals disagreed and supported a boycott call, making the issue a high-profile talking point in the serious media. PACBI, the Palestinian Campaign for the Academic and Cultural Boycott of Israel, has reiterated many times that BDS action targets only institutions identified with the state. It is not a vehicle for witchunting individuals. Unfortunately for Batsheva, the flipside of this is that an institution cannot escape being judged complicit by virtue of the views of individuals within it, however influential they may be. According to guidelines from PACBI, negatively distancing itself from Brand Israel is not enough to exempt an Israeli cultural institution from being targeted. It must end its complicity in Israel’s violations of Palestinian rights and international law. This would mean, at the very least, explicitly renouncing any cultural ambassador role and any funding from bodies that promote Brand Israel. Cultural boycott is becoming increasingly effective in one of its main aims – to generate a high level of public discussion and awareness of the Palestinian struggle for freedom, justice and equality. High profile campaigns have targeted the Israel Philharmonic during the 2011 Proms, Habima at Shakespeare’s Globe earlier this year, and now Batsheva. Even reviewers who chose to focus on the dance and play down the protests could not help but mention them. The company’s junior ensemble is scheduled to return to the UK for an eight-city tour in October/November. 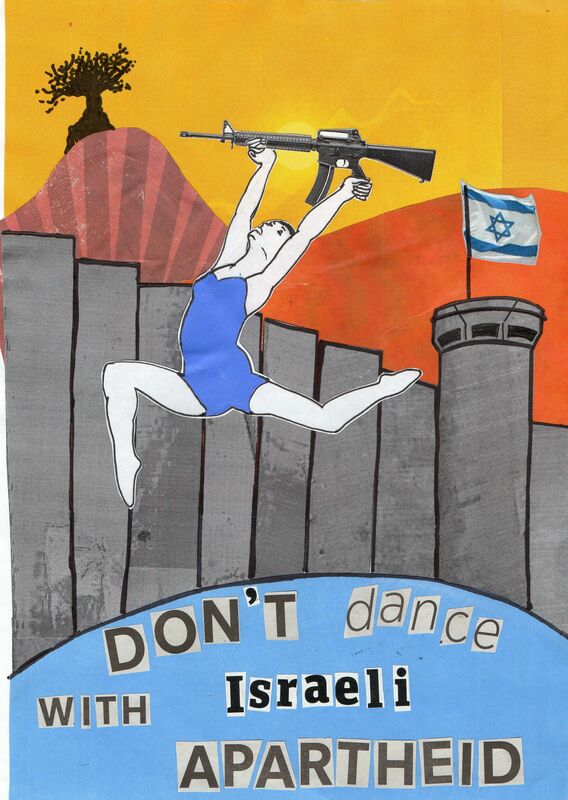 “Don’t Dance with Israeli Apartheid” stands ready to re-enter the fray. Achieving change is the desirable goal which will determine decisions to be made about tactics during the forthcoming Batsheva UK tour. Hopefully it will also influence decisions being made in the company’s boardroom in Tel Aviv. This entry was posted in culture, dance. Bookmark the permalink. Very interesting read. Well written. Boycotts lead to ahinalation. Looked what happened in Germany and Austria. You need to look at history. Those Arabs who feel they are displaced:Why won’t the other Arab countries help them? Look at what they tried to do to the late King of Jordan. You can not create a race of people for political expediency. Nice. See you all in Birmingham on 13th-14th November for the next round!